Lauren Van Arsdall and her French students at Flintridge Preparatory School in Los Angeles have connected with Peace Corps Volunteer Laura Scales in Cameroon through the World Wise Schools program. Lauren’s students are combing Global Studies and STEAM (Science, Technology, Engineering, Arts and Math) to create solar lanterns and durable books for students in Laura’s community. We asked Lauren about the rewards, challenges and lessons she has learned so far undertaking these endeavors and working with Peace Corps Volunteers. Real-life situations have led to more engaged discussions. We almost cancelled our video chat this week. There had been a Wi-Fi outage in Laura’s village. In the nick of time, she was able to send us videos. Students had questions for Laura about the outage and the recent election in Cameroon. This gave us the opportunity to discuss the elections and current events in Cameroon. How many days of sun does Cameroon have per year? How to design for the rainy season? Does the book need to be a book made of paper? I make fill-in-the-blank exercises based on Laura’s videos to review grammar points such as question formation, passé composé, imparfait and conditionnel, and learn vocabulary. Some significant words include améliorer (to improve) and maxims like “Ça va aller” (it’ll work out). We’re doing French while learning culture and the vocabulary necessary to get their projects off the ground! Lauren Van Arsdall and her French students in Los Angeles connected with a Peace Corps Volunteer in Cameroon through the World Wise Schools program. Synchronizing lesson plans has been hard. Unreliable internet in Cameroon has affected our ability to trade videos. Finding content online to supplement the videos and images that Laura shares with us has forced me to be a more creative and resourceful teacher. Keeping students in the target language is challenging. Has the STEAM project exacerbated this? To some degree, yes, because of specialized words, but this has given us the opportunity to grow. Students chose a solar lamp because Laura had told them that some termites had knocked out the power when they ate through a wooden electric pole. The group researched solar lamps and shared that they had seen a product similar to what they wanted to produce at the local grocery store. This version of a solar lamp is a cube of bubble wrap-like paper that inflates and has a solar panel on the top. I explained they could not simply purchase these lanterns and send them to Cameroon. Instead, they bought several and took them apart, examining the structure. How were they put together? How could they change the shape of these cubes to optimize light conditions for reading? Initially, the group thought of simply putting their storybook that had been printed on paper and laminated in a plastic storage bag. Not the best moment! Several students challenged this idea. Would a plastic storage bag hold up to the conditions? Probably not. They then went back to the drawing board and researched a weatherproof paper. The group also began with a desire to translate popular fairy tales. We talked through some of the culturally sensitive ways to adapt these tales to their audience. They did research on the animals and plants that live in Cameroon. Out of this research, they chose characters for their fairy tales. Have backup lesson plans in case the agreed upon date to share videos and images with your Volunteer does not work out. Be flexible. One day Laura was running behind, so we did a gallery walk instead. Students learned about girls’ education in Cameroon. I set up quotes and statistics about literacy. Students then made journal entries. Plan around themes. I’m teaching a pre-AP course. Our STEAM project, research and discussions with Laura are preparing students for the challenge of the AP level, while on-theme. You could adapt any of the raw materials such as videos and images that your Volunteer sends to intermediate level. Students’ knee-jerk reaction is to look to popular internet search engines for inspiration. Challenge them to go deeper and make a more specific design. Have them consider ways to improve an existing product. Encourage them to think of who they are designing for. Train yourself on the equipment you need. Take a class or an online tutorial. Seek ambassadors within your own department and across departments. Start with simple questions such as “What is culture?” to make your students more aware of their own backgrounds, traditions and customs. 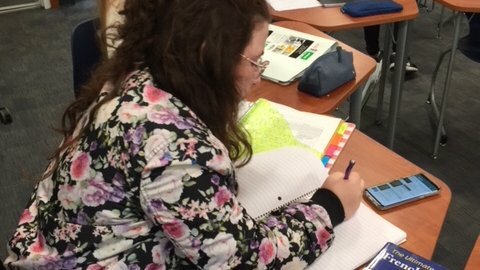 I found the World Wise Schools lesson plans and resources to be helpful for these initial conversations and check-ins with students. I created a packet that includes an overview of the conditional and imperfect, as well as hot seat games to play that cover cultural taboos and potential gaffes based on Laura’s experiences in the field. Our next video exchanges with Laura will cover the following: fashion, family structure and food. Stay tuned! 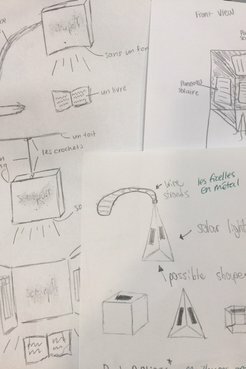 Next up, more images of the book and solar light design process – including a cameo of our 3-D printer – in anticipation of students sending their projects to Cameroon over winter break for field-testing! Dr. Lauren Van Arsdall teaches French in the World Languages Department at Flintridge Preparatory School, a private, independent, coed day school for grades 7-12. She is interested in cultivating 21st century skills such as collaboration, creativity, and cultural competency in her students, and is open to sharing pedagogical materials related to contemporary Francophone Africa. The Paul D. Coverdell World Wise Schools program is dedicated to promoting 21st century skill and global competence through stories, activities and classroom resources – all of which are based on Peace Corps Volunteer experiences.